Super absorbent polymer with baking soda help these training pants control heavy wetting and odor. Exclusive Softspand material is soft and comfortable, just like real underwear. 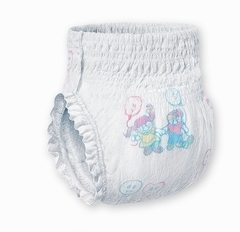 Full stretch continuous waistband with all-around leg gathers controls leaks and enhances comfort. Can be removed quickly to increase changing speed. Stretch Waistband Training Pants with Polymer Are Super Absorbent and Easy-to-Change with a Unisex design.